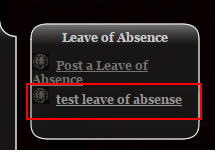 Hey guys, I'm looking for a way to set up a button in one of my menus (I'll make a graphic for it as a link) that will open up a pre-formatted post in our Leave of Absence thread tag. This has two reasons. First, so that when our Raiders post an absence they don't have like 2 or 3 thread tags assigned to the post since they like to check boxes and avoid the drop down box for some reason. Secondly, our Lead that is in charge of our Attendance and such would like to have a more organized way of finding the posts since this would assure they are all in the right thread tag. Right now, I have a menu category set up with a link to one of our pages, but I don't know how to be able to set the post to always go to our specific thread tag. I don't want to make Leave of Absence our default thread tag since that would exacerbate the problem. We don't use the calendar on the site since our raid times never change and it became a hassle making people sign up on the website every week. Anyone know of how to do this? Along those same lines, is there a way to turn of secondary thread tags? and/or just use the check boxes instead of the drop down box? It seems to be a mechanic only few of us can seem to master. Or if there's some way to allow me to make a button that they can click on that would post directly to the calendar as an absence that would be amazeballs too! Where 36 is the ThreadTagid of your "Leave of Absense" thread tag. As for disabling secondary threadtags, that's not currently an option. I definitely appreciate you pointing me in the right direction for it. Hopefully I can figure it out, got some people that think it will help a lot. Thanks man! I've added a "test" link to your menu. Check it out, this should help you out a bit. LOL, complete with spelling error. LOL! Spelling is for nerds anyways, amirite?! I thought it was perfect! Looks like exactly what I'm lookin to do, but it pops up on every load of the site pages for some people (me included). Wife's computer does it and couple of the members said they're getting a pop up block all the time. Sweet, got it fixed! Thanks so much for the help! Great! Glad to hear it. I didn't have a chance to check it out while it was busted, but I'm curious what the error was that was causing it to pop up on every page load.